With the extremely high interest I get (both in terms of direct emails, as well as through traffic to the site) about prepaid hotspot functionality, I wanted to post some information here to ensure that visitors to the site get easy access to the information you're looking for, and can easily find the desired details. Below you'll find links to hotspot related pages. Just quickly, for those of you who have heard this term, but who are not yet quite sure what it means, a mobile hotspot is a standalone modem that has both a cellar and WiFi connection. The cellular connection is used to gain access to a wireless carrier network (ex. 3G, 4G). The WiFi connection is what you use to connect your WiFi capable device to (ex. computer, smartphone, tablet, game console, etc.). The genius behind this type of modem is that it doesn't require any software drivers to be installed. Just setup your network name and password (recommended! ), and connect to it just like you would with any other WiFi network. The links below provide more information around how it works, as well as the general pros and cons. Here, in addition to consolidating these other resources for people perusing the prepaid broadband reviews section of the site, I wanted to note that I strongly believe these MiFi hotspots will take over the mobile broadband market. The only thing stopping that from happening beyond general awareness of its capabilities is battery life (in my opinion). USB to keep in charged. I do this regularly. Though, admittedly, I do find it somewhat annoying to have it dangling from my laptop. While that does help to ensure that I don't lose it(! ), it's certainly an inconvenience to have to deal with a cable. And if you've got a tablet, you won't be able to charge it from there at all as they don't have USB ports. So having to worry about keeping it powered up is a concern that I completely understand. For me, I would love to see the size of the device increase. Yes, I said increase! While electronics companies are constantly trying to miniaturize everything, I'd much rather carry around a larger modem in my pocket, briefcase, or jacket pocket, that has a battery long enough to last for 8-10 hours at a time or more. I don't think this is a unique problem. Battery life for most of our modern gadgets is still a real problem. I don't, however, feel that hotspots need to suffer from this issue while battery technology catches up with our power-hungry gadgets. Simply enlarge the device, and use that extra space to fit it with a huge battery! Anyway, with all of the interest I see around the prepaid hotspot option, I predict that USB modems will become a distant memory sooner than people think. After all, why would you want to get a mobile broadband device that can only connect to one device at a time, when you can get a MiFi hotspot that can connect to 5-10 WiFi gadgets simultaneously! Please feel free to share your comments, thoughts, and experiences below! I wanted to update this thread now that so much time has passed. While MVNOs like FreedomPop can die at any time, it's clear that they've been doing very well, and continue to expand their services. I have personal experience using their device, and have been quite happy with its performance and pricing. They've also since launched their program on smarpthones, which has really helped them to gain even more attention. No provider is perfect, however, in the realm of prepaid hotspots, including a free service offer, they continue to be one of the most popular companies in terms of clicking through from this site to purchase products from FreedomPop. It would be great to hear feedback directly from these customers. Hopefully one day they're come back and share their experiences! I do have to say that one area that I feel they have failed is with their device offerings. They definitely have a vast selection, which is great. HOWEVER, it's truly overwhelming with no tools to truly understand the differences between devices. I believe they're sourcing good value devices, and throwing them on their site. As a customer, though, it's nearly impossible to understand the differences, and price is often not a reflection of quality or features. I really just made my best judgement. I wanted a device with long battery life, and 3G/4G compatibility. I should also add that their customer service wasn't at all knowledgeable. In fact, they made statements about network compatibility that I pointed out to them were not correct. Anyway, hopefully this shortcoming doesn't scare off prospective customers by a fear of making a perceived bad decision. Note that there are a number of other prepaid hotspot providers that have continued to evolve the value of their plans, and most of them are quite competitive. So, please don't forget to compare your options in order to make the best decision to meet the needs of your personal situation! It will be interesting to see how FreedomPop evolves over the next couple of years, and I'll continue to report back. 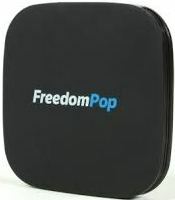 I wanted to share my thoughts about FreedomPop. I really like their business model, and have been keeping an eye on them since launch. When they originally launched, they didn't have any modems that were 3G compatible (only 4G), so, unfortunately, I couldn't test it as they don't yet have coverage in my area. They now have 3G backwards compatible modems, which is great, because it means more consistent and reliable coverage no matter where in the country you happen to be. I am not, however, interested in buying their 3G/4G WiMAX hotspot as WiMAX technology is being decommissioned shortly; I don't want to have to buy another modem within a year. Fortunately, they now also have a 3G/4G LTE hotspot. However, at $150, I'm not interested, as I already have other modems that meet my needs. That said, I'd like to get it for the sole purpose of reviewing the service on this site. When the price comes down to sub $100, I think it will be more appealing to prospective customers. Also, note that the 3G/4G modem requires a minimum monthly plan of $3.99. While this is a very good deal, if you want the truly free plan, you're stuck on 4G only, which is unlikely to meet most people's needs unless you live, work, and play where they have 4G WiMAX coverage. Of course, this well change over time as 4G becomes ubiquitous. One nice feature is that you can upgrade to rollover unused data for $3.99/month. I feel this price is very reasonable if you're staying within the 500MB monthly limit regularly, with periods of extensive data usage. Rollover is included in their $20/month 2GB plan. The one element of FreedomPop's plans that really irritates me is that if you want alerts to let you know you're running out of your data allowance, it'll cost you $1.99/month. They key point here is that when you go over your allocation (whether on the free or paid plans), they start automatically charging you for overage on a per MB basis. Personally, I feel that this type of alerting should be free, and is a basic part of a good customer experience. I don't want to have to monitor my data that closely in my account, or be in the middle of a data intensive activity, only to go over my limit and be charged a fortune. In other words, if customers like your service, we'll buy more data; please don't charge us automatically. This feels like a slight of hand, as though they're counting on this type of overage to make their business model work, or the alerts fee to drive additional revenue. They do note that when you get the alert, you'll be offered a discounted plan price when you reach your limit, however, they don't describe what that is. Depending on your usage, it could be worthwhile, however, the idea of paying for such alerts just puts a bad taste in my mouth. All-in-all I feel that FreedomPop has great potential. They just need to make sure that they don't get too fancy with additional small fees for features, making customers feel as though we're being nickle and dimed. Keep things simple, reasonably priced, and get rid of the WiMAX modems(! ), and I expect they'll do well.